Rounding the corner: A member of a TA infantry unit in Afghanistan. Reserve forces are set to play a vastly increased role by 2020. Source. 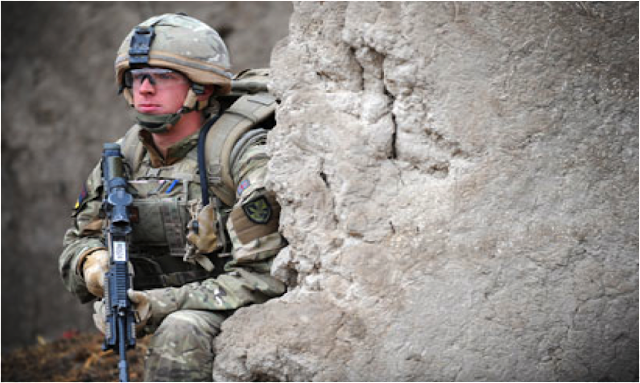 By 2020, Britain will have an Army at its smallest size since the start of the Napoleonic Wars. This will entail a cut of almost 20,000 full-time soldiers, down to a figure of 82,000 – this, however, is not the mindless slashing exercise that some corners of the military establishment have spoken out against since the announcement of sweeping defence cuts in 2010. The government has made it clear that it feels Britain cannot afford to maintain an army at constant readiness to fight a major conventional war – by necessity, this Army of Austerity will be fundamentally different in nature from the force that has fought in Iraq and Afghanistan during the past decade. Our current standing Army is essentially a much-reduced and streamlined version of the force Britain maintained throughout the Cold War. Forget Afghanistan and the fact that the last prolonged conventional conflict in which the UK has been engaged was in fact World War 2, the structure of our current Army has remained essentially designed to fight a defensive war in Europe – the occupation and counter-insurgency operations that the Army have been involved in during the past decade are deviations away from the traditional doctrine of high intensity inter-state conflict, the ‘standard model’, as it were, of armour-heavy manoeuvre warfare that has been at the heart of British Army for over 70 years. The problem is just that – the threat of the Warsaw Pact steamrolling through the continent has been dead for over twenty years. Russia, the old enemy, is weak, and the apparent lack of any true threat to Western democracy makes it hard to justify the existence of an Army designed to hold back the tide of international Communism. Politicians are hedging their bets that it is unlikely another existential threat will appear or major conflict take place in the foreseeable future in which Britain is required to mobilise a substantial force within short notice. This is perhaps an accurate assessment of the geopolitical situation – and is certainly one that lends itself to the imposition of cuts under the auspice of austerity measures. Whilst there is clearly no love lost between the Army and the ministers at the Treasury, it is clear, however, is that the Army itself has been instrumental in shaping the direction of the cuts in order to come out of the process with the structure it believes will serve it best in the future. The result is the greatest shake-up in the British Army for nearly a century. The Army, according to current plans for restructuring, will be comprised of three elements: a conventional combat division, an adaptable infantry arm and a third tier of logistical support elements. The combat division will effectively be formed of the armour-heavy elements of our current Army, designed to be utilised as a rapid reaction force capable of engaging in the high-intensity conventional warfare expected at the beginning of an invasion (be it at the giving or receiving end of hostilities). The ‘adaptable’ arm will consist of light infantry battalions, suited to the counter-insurgency and low-level warfare role that the Army has played for the past decade. It is also envisioned that this element will be deployed as part of humanitarian and peacekeeping missions, as well as serving abroad in our overseas commitments in Cyprus and the Falklands. Most critically, however, this element will be comprised of an unprecedented level of reserve forces, at 30% of overall strength (in comparison with the 10% comprising the armoured force). The third logistic element will act as an enabling measure between the two other components, providing intelligence, communications and technical support – following lessons learnt over the past decade, the intelligence gathering and processing component of the British Army is to be bolstered over the coming years. This restructuring from our current model of effectively two combat-ready divisions to a split between high-intensity and low-intensity warfare options has several implications. Importantly, it manages to retain the ability to engage in a conventional engagement, whilst allowing for inevitable bite of the cut of 20,000 service personnel. It also recognises the clear trend in the development of asymmetric warfare – in the past 20 years, Britain has been engaged in just over 3 months of conventional warfare, compared to the past 11 years of continuous counter-insurgency warfare, variously in Afghanistan and Iraq. Doubts, however, have been raised from several prominent corners of the defence establishment. Can this slim-line Army can provide the adequate capabilities should war become a reality? The armour-heavy division has the strength of what is essentially an expeditionary force - whilst maintaining the resources to engage in conventional warfare, it does not have the sheer quantity of men or material to maintain combat effectiveness in a prolonged high-intensity engagement. Aside from cutting the number of troops, the government has also made it clear that it does not wish to foot the bill for maintaining top-shelf items to the same extent, meaning that a number of Challenger 2 regiments and mobile heavy artillery components are likely to be phased out. Whilst elements from the light infantry division can bolster the strength of the combat division should the need arise, the lack of heavy equipment cannot be cheaply or quickly replaced. Questions have also been asked over the effect of integrating such a large reserve element into the light infantry division. Should the government be serious about expanding the role of reserve forces, it needs a far larger, and perhaps more dedicated, Territorial Army. This will require far more concrete terms of service, alongside the outlay of casting the TA recruitment net far wider than current capacity. These fears must be met and overcome. No matter what the eventual shape of the British Army by 2020, save for another major conflict the likes of Iraq – and, at the current time, it is hard to discount such an occurrence – it is clear that an overwhelming political consensus remains in favour of substantial cuts and reform. It is a positive sign that the Army higher-ups have embraced reform and devised a sensible structure that reflects an uncertain future. It is clear, however, that this future Army will be operating at a minimum capacity, below which it will be rendered impotent. Politicians must refrain from future cuts lest they irrevocably damage Britain’s ability to project itself on the international scene, and, importantly, defend the nation from threats that exist today. Politicians willing to sacrifice national security on the alter of austerity play a dangerous game – it is unlikely that the nation will forgive their recklessness, nor an enemy fail to take advantage of their mypoia. For a detailed examination of the proposed reforms on the British Army, http://ukarmedforcescommentary.blogspot.co.uk/2012/07/army-announcement-not-all-questions-get.html features an extensive breakdown of the proposed changes.